Derry City's Michael McCrudden tussles with Cork City defender Dan Casey. DERRY CITY produced a gritty performance to deservedly earn a point at Cork City. This was exactly the type of performance Declan Devine has stated he wants from his players every week and in skipper Barry McNamee he lead by example and gave his all, in fact deep into stoppage time he made a lung bursting run to deny Karl Sheppard a goal scoring chance. The Brandywell men had their chances on the break, but it was their never say die display, which was very pleasing. As expected Derry manager Declan Devine kept faith with the side which defeated Waterford on Monday night, however Ciaran Coll had to replace Patrick McClean just before kick-off, after the Creggan man picked up a quad problem in the warm-up. The Rebel Army also stuck with the same team which secured their first victory of the season at Sligo Rovers, also on Monday evening. At a very wet Turner’s Cross it was the visitors who had the first half chance early on but Cork keeper Mark McNulty just about got his clearance away before Junior Ogedi-Uzokwe was able to block. 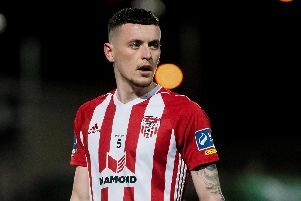 The woodwork came to Derry’s rescue on 35 minutes as left-back Shane Griffin broke forward, before seeing his low 25 yard drive clip the outside of Peter Cherrie’s left hand post. Derry started the second half on the front foot and they were inches away from taking the lead on 48 minutes as Ally Gilchrist, who came out from defence, saw his 35 yard drive tipped over by fully stretched McNulty. From McNamee’s resulting corner from the right caused more problems for the home side, but Ogedi-Uzokwe and Gilchrist were unable to get the loose ball over the line, before McNulty could concede another corner. Cork started to get more and more into the game after making changes on 58 minutes with Colm Horgan and James Tilley replacing Sean McLoughlin and Daire O’Connor. Firstly striker Liam Nash broke clear of the Derry defence, but an alert Cherrie rushed off his line to clear the ball. Then just after the hour mark Cherrie’s poor punch fell perfectly for Garry Buckley, but the big midfielder’s effort from just inside the box was superbly saved by the Derry net-minder. Cork substitute Horgan saw his right wing cross found fellow sub Dan Smith, but the big striker on-loan from Portsmouth, headed wide from close range. Another high ball into the Derry penalty box caused problems but centre-back Conor McCarthy saw his close range strike, fizzed just wide. In closing stages Derry nearly nicked it on the counter attack but Derry substitute Aidy Delap’s 20 yard left footed strike was deflected wide by Horgan. Cork City: McNulty, McCarthy, McLoughlin (Horgan 58), Casey, Griffin; McCormack, Buckley, Morrissey; Sheppard, Nash (Smith 78), D O’Connor (Tilley 58).